This will strike up as some good news to Windows Phone enthusiasts, that’s if you havent already picked the whiff of the story. Apparently some court documents regarding Samsung’s case against Apple in the US have some info about two Samsung Windows 8 devices coming out in Q4 this year. 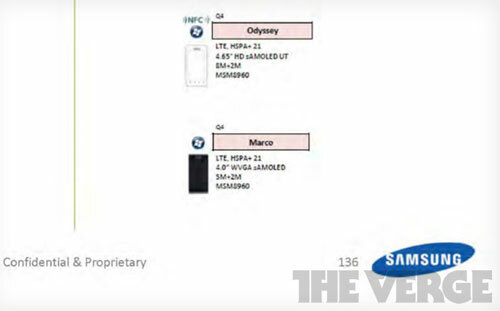 These two devices are Code-named Samsung Odyssey and Samsung Marco and have some pretty good specs according to the document. The two devices spot a 1.5GHz dual-core Qualcomm Snapdragon MSM8960 processor, which for Windows phone is quite good. The Odyssey, according to the revelation will run a 4.65 inch HD Super AMOLED display, an 8MP AF rear camera and a 2MP front camera. It will support NFC, HSPA+ upto 21MBps speeds and LTE. The Marco will have a 4 inch WVGA super AMOLED display, rear 5 MP camera and a 2MP front, NFC, HSPA+ upto 21MBps speeds and LTE. As we have discussed before, WindowsPhone 8 will allow OEMs to use the same basic hardware for either Android or WindowsPhone phones. Prior to this, the lack of support for high end hardware specs (high res screens, multi-core processors) on WindowsPhone 7.5 devices complicated the supply stream for OEMs. NOTE: Users should note that WindowsPhone was designed to efficiently use all the resources on the phone. That is why it is fast and fluid on single-core devices. So seeing Windows Phone on DC devices should have an even smoother and faster experience. I still have a hard time believing that Windows Phone will have an easy time scaling, there is so many hurdles they have to jump to actually be competitive with other platforms.